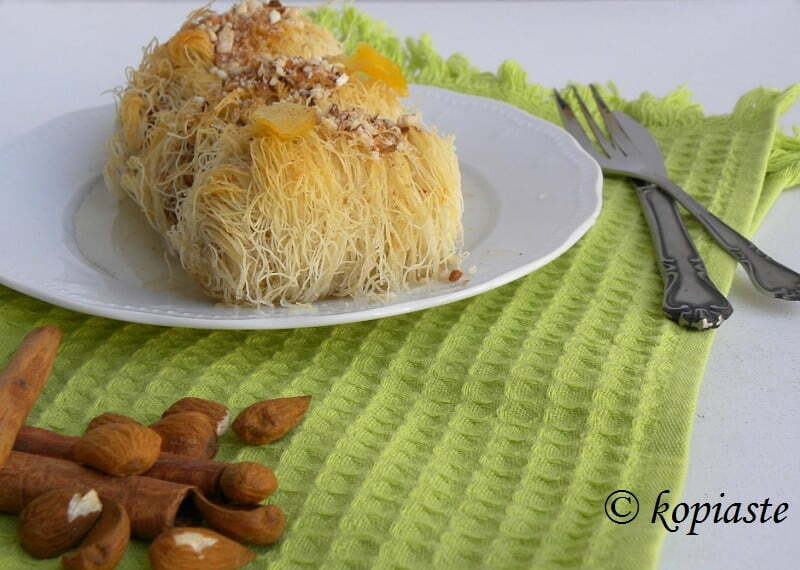 Kantaifi (pronounced Kan-ta-EE-fi) also written kataifi, is a pastry made with a special form of shredded phyllo dough which looks like vermicelli pasta. It is used to make a delicious dessert also called Kantaifi, which encloses a filling with chopped almonds, sugar and cinnamon. An aromatic syrup is made which is poured on top of the kantaifi, which makes it soft and sweetens this delicious dessert. We are already in our first week of the new Year and would like to wholeheartedly wish you all to have a creative and productive New Year and most of all a “sweet” new year ahead! In the older years, this used to be one of the traditional desserts which was served during Christmas. However, it doesn’t have to be Christmas to make this delicious dessert and we love to make it quite often. Almonds are the traditional nuts used in the filling but in other parts of Greece, where walnuts or pistachios are cultivated, they make kantaifi with these nuts or a combination of them. The dough is wet with butter before baking. In many parts of Greece where goats and sheep were bred they would use ewes and/or goat milk butter. In other parts of the country they would use cows’ milk butter or lard or if they wanted to make it vegan during fasting periods, they would make it with olive oil or vegetable shortening. The syrup can be made with sugar and water, scented with either spices, citrus or vanilla or made with honey. Kantaifi dough is sold fresh or frozen. I remember years ago you could buy it fresh from small workshops but now you rarely find them any more. There may be only a handful left all over Greece as now this pastry is sold in all the supermarkets. You can find it in the frozen products section together with other products made with phyllo. If you buy it frozen, it is best to leave the kantaifi in the fridge for a couple of days to thaw but if you are in a hurry, you can also do this by leaving it outside the fridge overnight. It takes a few hours to thaw, so plan ahead. When thawed, it resembles a thick mass. The strands should be separated by pulling them apart with your fingers until they become light and fluffy and no strands are attached to each other. You can do this as you work with the pastry by pulling an amount of dough and separating it before adding the filling. You then put it in the palm of your hand, add the filling and tuck the sides over the filling so that the filling is enclosed. Then roll it up a couple of times to the desired thickness. When done, if there is more kantaifi dough left, just pull it with your hand to cut it. During summer, like any other type of phyllo, the strands will dry out easily and crumble, so it is best to keep them covered with a damp kitchen towel. Back in Cyprus, my mom would make this dessert every year on “Kathara Deftera” (Green Monday) and as it was the first day of Lent, she would make it vegan. Instead of butter she would add spry, a vegetable shortening, which is still used in Cyprus. She would not use olive oil as the olive oil we used to have back then in Cyprus was too intense in flavour. Now that I live in Greece, there are many grades of olive oil and whenever I want to make it vegan, I use a fruity and mild one which makes it delicious. One tablespoon of olive oil on each rolled piece of kantaifi is enough. For many years I would also follow this tradition and make kantaifi on Kathara Deftera. I thought I had posted the recipe at the beginning of my first blogging years but I was surprised to recently discover that during these nine years of blogging I never posted this traditional recipe before, although I did add other recipes made with kantaifi! Kantaifi (pronounced Ka-ta-ee-fi), is a pastry made with a special form of shredded phyllo dough which looks like angel pasta. It is used to make a delicious dessert called kantaifi, which encloses a filling with chopped almonds or walnuts (and sometimes other nuts), scented with rose water, ground cloves and cinnamon. When baked it is then drenched in an aromatic syrup. Prepare the syrup. Put all the ingredients except the lemon juice and rose water in saucepan and boil for five minutes. Mix in the lemon juice and rose water and turn off the heat. Preheat the oven to 180o C / 350 o F.
Coarsely pound the almonds using a mortar and pestle or in a food processor. Add the sugar, cinnamon, cloves and the rose water and mix. (If you like, reserve some almonds with sugar and cinnamon before adding the rosewater to sprinkle on top). Melt the butter in a nonstick skillet or pan over low heat. See how to clarify butter. Grease a 24 – 26 cm baking tin or Pyrex. Cut a piece of dough and fluff it by pulling the strands. Put it in the palm of your hand, add about a heaped tablespoon of filling and tuck the sides over the filling. Then roll it up a couple of times to the desired thickness and pull the leftover strands to cut them. Place each roll next to the other on the greased baking pan. Divide the melted butter with a spoon to evenly wet the rolls. Bake for about 40-45 minutes or until golden brown on top. While still hot, drizzle the syrup on top, using a spoon so that it is evenly wet. Set aside until it absorbs all the syrup. Sprinkle some ground almonds on top (optional). It can be stored at room temperature, covered, for several days. If you liked this recipe and would like to try more Traditional Greek Desserts, you can download my free e-book by just subscribing to my blog. I have never had a kantaifi…they look so cool and I love its crunchiness and nutty filling. Great recipe, I love Greek pastry and I have to try and make this one. I love kataifi. I had it first time in London and since then I always take the time to have a cup of tea and kataifi. It is a pitty that we do not find it in standard supermarket. I always have to travel miles before I get some. I guess if you want tasty things, you need to work hard for them. Now that I have the recipe, I’ll try to make it home. i am sure it will not be as good as the shop one, but hey, at least I do not need to travel miles away.